So what is it like to live with a Singapura cat? Well one thing is for sure – it is never boring! The ancient word “Singapore” means “the Lion City”. Originally Singapore was knows as Temasek (Sea City), but the name was changed when a visiting prince thought he saw a glimpse of a lion on the island. Thinking about the Lion City, the Singapura cat has a fitting place of origin – they do have the heart of a lion when it comes to curious explorations… Many also call this little beauty the “little lion” – their small size certainly does not match their huge personalities and enormous curiosity. 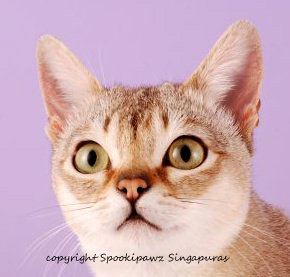 What you notice first in a Singapura cat are those huge eyes and ears in such a tiny little cat – not to mention its almost angelic expression. This is usually enough to make people admire them. But once they get to know Singapura’s personality, they fall in love. 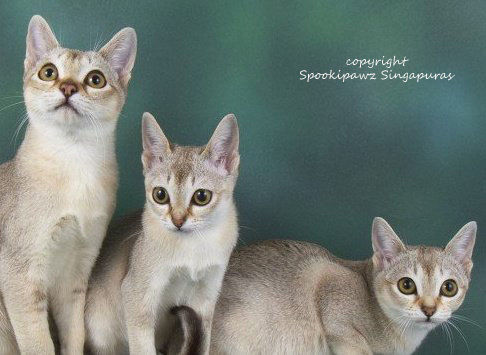 The Singapura is really small - it is the smallest recognized cat breed. The females weigh 4-6 pounds / 1.8 – 2.7 kg. The males are a bit bigger, 6-8 pounds / 2.7 – 3.6 kg. (Compare this to the biggest cat, the Savannah, which weighs around 30 pounds / 13.6 kg!) It is like they are eternal kittens that never grow up. The Singapura has a beautiful, silky, ticked coat. The base color is old ivory or unbleached muslin. Each hair has four bands of color – the lightest color is next to the skin, then comes a band of brown, another light band, and the tip of each hair is dark again. This color, the sepia agouti, is caused by the agouti gene, and the result is very elegant and delicate. Some say the Singapuras resemble a cougar in coloring, and it is easy to see why. This is an active cat, curious and playful. (Maybe not quite as playful as the Aby, but almost!). Still, they don’t cause havoc with their playfulness like some cats do. They just love to play. And they love to run as they play, so be prepared for a cat playing ice-hockey with a toy mouse appearing suddenly out of nowhere, and vanishing at the same speed… They also love to carry small balls and toys around. And you can teach them to fetch, but more often it is the Singapura that teaches you they want you to throw things for them to fetch. And trust me – they are very good at training humans to do as they wish. It is like the Singapura is an eternal kitten that never grows up. They bounce around like kittens even when they are old. A Singapura cat is keenly interested in their surroundings and considers it its born duty to supervise everything you do. In all probability the Singapuras are constantly planning some sort of mischief, but it doesn’t consider it as such – it is simply doing all sorts of explorations and experiments to keep up to date with its surroundings. the good job they do at this. This cat has the true old fashioned explorer spirit, and its agility and ability to climb and squeeze itself into trouble has a real purpose. Because of this explorer spirit the Singapura adapts easily to new environments and bonds almost instantly with its humans. It is also very loyal to you and your family. 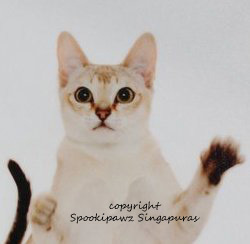 To strangers it may appear a little bit shy at first, but their great curiosity takes the better of them very quickly, and so you will probably see your Singapura cat greeting your visitors by the door with you. It may choose its favorite greeting of head-butts, which may surprise an unsuspecting visitor who has bent down to untie the shoe laces. The Singapura is a very intelligent cat, and also very much in tune with your moods. If you have a bad day, you will probably find your Singapura comforting you by purring in your lap or crawling under the blanket with you. If you are in a good mood, the Singapura helps you in staying cheerful by playing with you. The Singapura knows exactly how to make you do what it wants. It just adores you with those huge eyes and looks too cute for words, and there you go, willing to do anything it wants. You may try to resist, but it really is futile. The Singapura just charms you so that you don’t even realize how it wrapped you around its cute little paw. But they are not selfish in their charms – they really seem to need human company and show this in the most adorable ways. A Singapura cat sleeps in your bed, and as it seems to be quite a little heat pillow, this is rather handy in colder nights. It really is surprisingly warm – and if you have more than one Singapura, you are well warmed! You will probably find the whole bunch under your blankets come morning It really loves to snuggle under your blanket. If you cannot find your Singapura during the day, just check your bed. It probably is there, all tucked in. It loves heat… So which ever spot is the warmest in your house, know that it is the property of your Singapura. A Singapura cat loves to jump and climb high. Riding on your shoulder is a given, so be prepared for it. Also do not wonder if your Singapura climbs up the doorframe to get on top of the door. 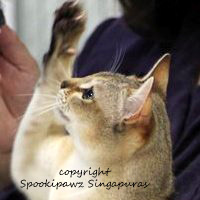 It seems a Singapura enjoys life most when it has all of its four paws firmly in the air. A Singapura cat can be so affectionate it is almost overwhelming. Some call this behavior as “aggressively affectionate”, which basically means that your cat considers it the most important thing in the world to show you it loves you – and expects you to adore it right back. It follows you around and can have long discussions with you with its quite voice. It may take it as its duty to groom you, which means it will come and begin to wash your hair the kitty way. Someone called them lovable little imps – they respond to everything you do. Definitely not a cat for someone who wishes to keep their space. If you feel all the attention is a bit too much, get your Singapura a feline friend. The Singapura cat needs company, so it is not a good choice for single households where it has to spend long periods of time alone. Most people, however, find this behavior quite endearing, because it is really caused by the fact that this little kitty just adores you to no end (This love of humans is rather surprising really, considering the ancestry of the cat). And so you will probably find yourself having meow-conversations with your Singapura cat while you cook (its favorite past time), type with your computer (your Singapura may wish to write a few words too and of course chase the cursor), or wash your teeth (water interests Singapuras, so be prepared for water flying around if you keep the tap running). A Singapura cat loves and expects to be the center of attention. It may interrupt your other activities that do not include Singapura-worship. Just you try to read a newspaper and you will quickly see what this means. Your Singapura will come and sit in the middle of the article you thought was worth reading, because it knows you could spend your time better – adoring your Singapura. After all, observing and supervising everything you do is hard work, and the Singapura expects to be adored for it. (And sitting right into your newspaper sure gets your attention.) You are the Singapura’s favorite past-time. You have TV. They have you. Like many cats the Singapura has one favorite human, but it shows its affection to the whole family. It is usually good with children, but even this little adorable creature can be traumatized by mishandling in the hands of little children (not all Singapuras enjoy loud noises). So supervise your children, and teach the little ones how to handle a cat. The Singapuras are easy to handle and good-natured, rather undemanding, calm and even-tempered. They get along well with other pets, and because of their very outgoing and social nature it is actually good if you have at least one other cat to keep your Singapura company. This cat’s adorable, enchanting personality causes it almost never to be confrontational (it would really need to feel itself threatened somehow to show negative behavior). If you are lucky enough to be owned by several Singapuras (and if you get one, you’ll soon want another, so this is a real probability), you’ll probably find them sleeping in a heap (in the smallest place they can squeeze into). Even stud males that in other breeds would be fighting with each other just love each other. No hissing, no aggressive behavior. The Singapura cat does not understand aggressivity. If you can choose to sleep in a warm pile with the other Singapuras, why ever fight? Cozy and comfy is best. And one more good thing about Singapura males is that they do not mark their territory like cats usually do. This, in addition to their amiable behavior towards other males, makes living with them all the more pleasant. The females are usually more dominant than the males – but they are also very good mothers and seem to love taking care of their kittens much longer than other cats. In fact it seems it is willing to nurse its old litter until a new litter is born. 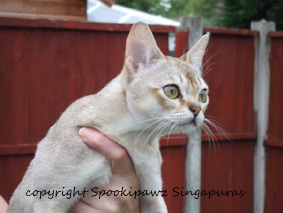 A Singapura cat matures slowly – the females do not usually come into heat until they are over a year old. And the males do not begin to breed until they are around fifteen months of age. So this is a slow maturing cat breed indeed. With good care you could expect your Singapura to live even over 15 years of age. This is a rather healthy breed, despite it’s the small original gene pool. They may have trouble delivering kittens, as one of the breed’s foundation cats had uterine inertia, which means the cat in unable to push the fetuses out because of weak muscles. So basically the cat does not get into labor and caesarian section is needed. There has been some reports of PK Deficiency in Singapuras (Pyruvate Kinase Deficiency). This inherited disease causes the red blood cells dies faster because of enzyme deficiency. This may cause anemia. A cat with this gene does not necessarily have symptoms, but if both parents have the gene, a kitten may get the disease. Responsible breeders are testing their cats for this, and the test is not difficult to do. You don’t need to brush your Singapura often, because its coat is so silky, short and close-lying to the body. A weekly brushing is enough – unless, of course, your Singapura makes it clear it loves to be brushed more often. If this is the case, you will find yourself charmed into more brush-work. Some people owned by Singapuras like to stroke their cat with chamois leather, as this increases the shine of the coat. And as long as the cat is happy, why not? Some do a once-a-month wipe with a damp washcloth. A Singapura cat does not shed much, but it does shed some, and so this kind of care decreases the amount of cathair in your home. So, if you are searching for an active, pretty cat that loves you to no end, and is your constant companion, then the Singapura cat is sure to charm you. And they say that once you get a Singapura you never want cat of another breed again. Here you can read more about the history of the Singapuras. And here you cat read about the looks of the Singapura. And a page for Singapura rescues. Do You Have a Lovable Singapura? Do you have a purrsonality of a Singapura? Or even more than one? Tell us! What is the funniest thing they have done? And add photos too if you have them - we love photos of Singapuras... They just are soo cute!